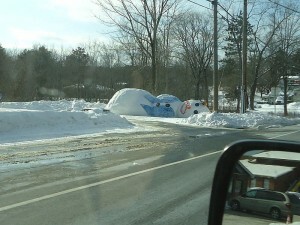 And it’s not snowing.Some of the ends closest to me are the state ends of US 20 at the New York-Massachusetts border. 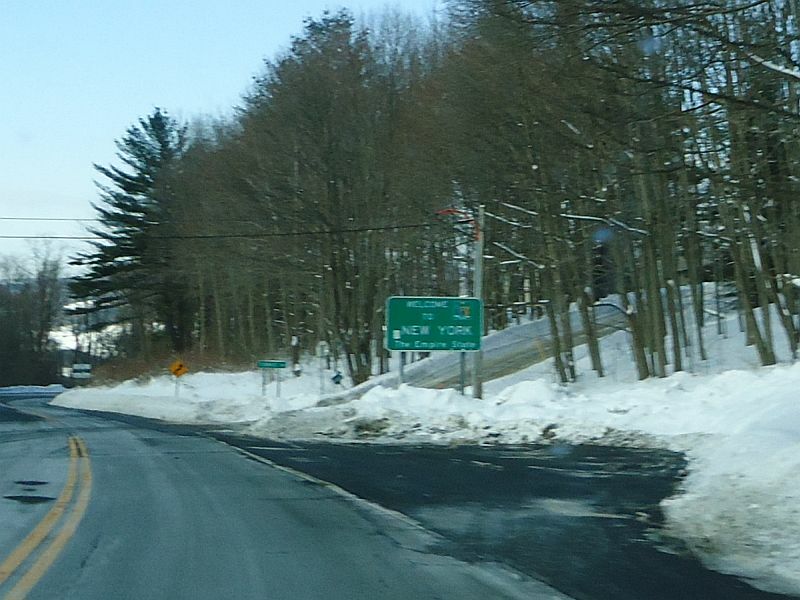 I headed over to where US 20, in conjunction with US 9, came over the Hudson River from Albany. I didn’t get very far, as 9/20 was shut down, police cars, barriers, the whole works. Still there when I came back the other way. Turns out there was a water main that had rudely broken on the day I wanted to drive US 20. 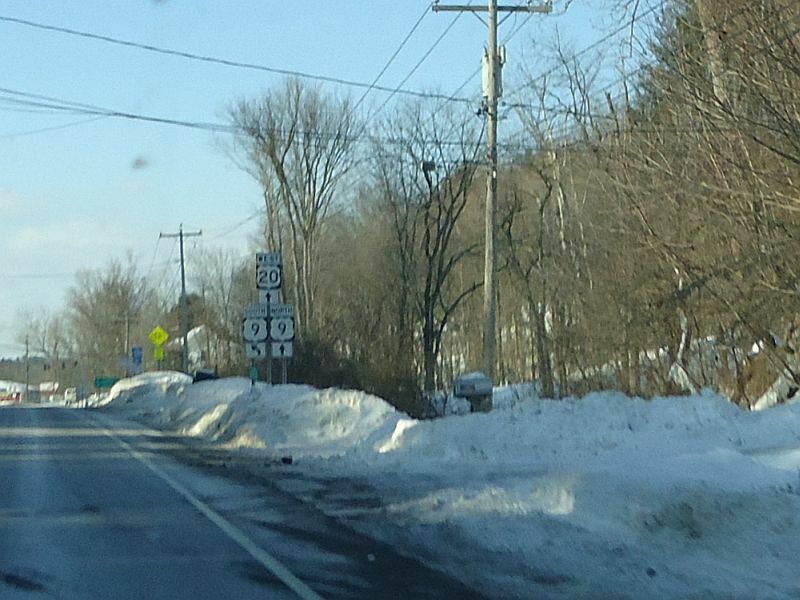 After meandering around assorted side streets, I got back on US 20 just east of the junction with 9J. Fascinating facts about US 9 and all its subroutes in New York flashed thru my mind. Yes, I told myself, we will do US 9, and maybe all its little pieces. 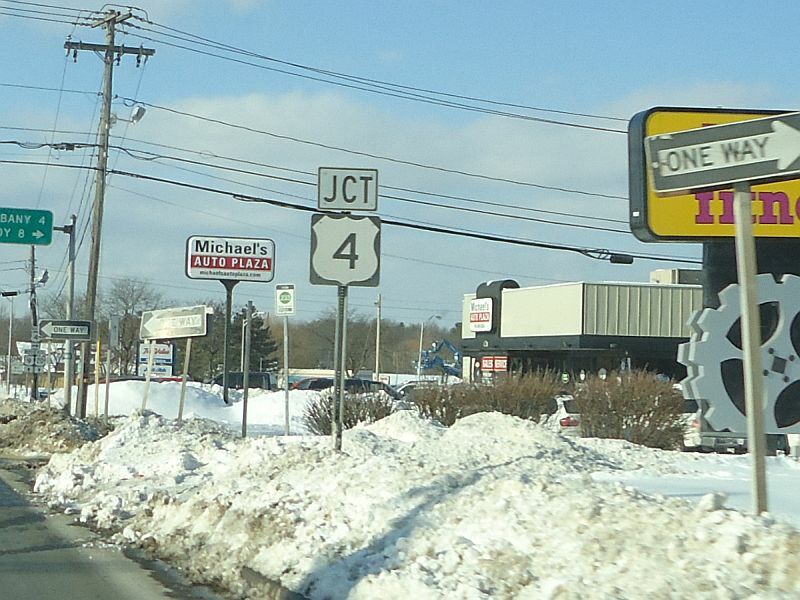 Thru Rensselaer traffic, thru Greenbush, over I-90, Schodack, and into snow-covered countryside. Up over the Taconics, then into the Berkshires. 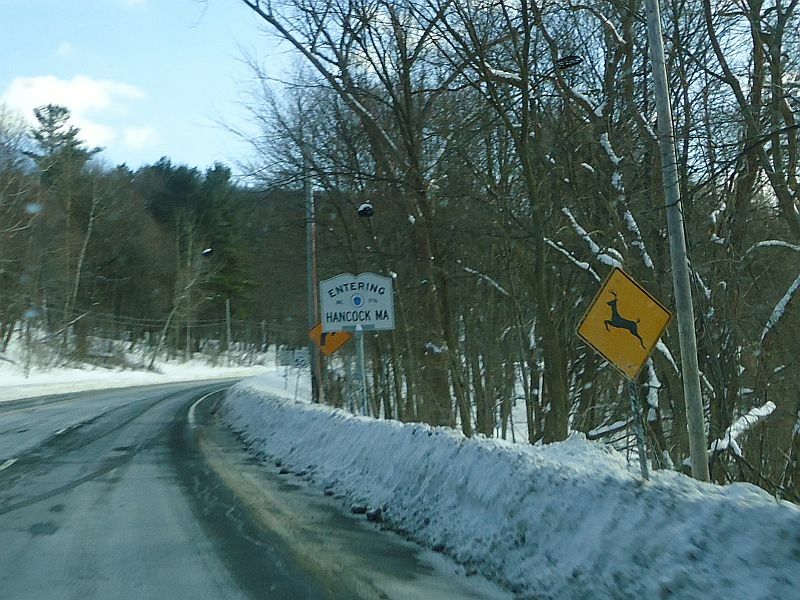 And then the sign that said “Entering Hancock MA” went by. Find a place to turn around, go back. And drove right past the sign that said Welcome to New York. Well, at least now I know what the road looks like, the curves, the signs. 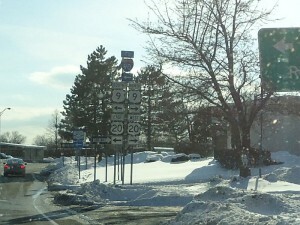 East end of US 20 in New York. 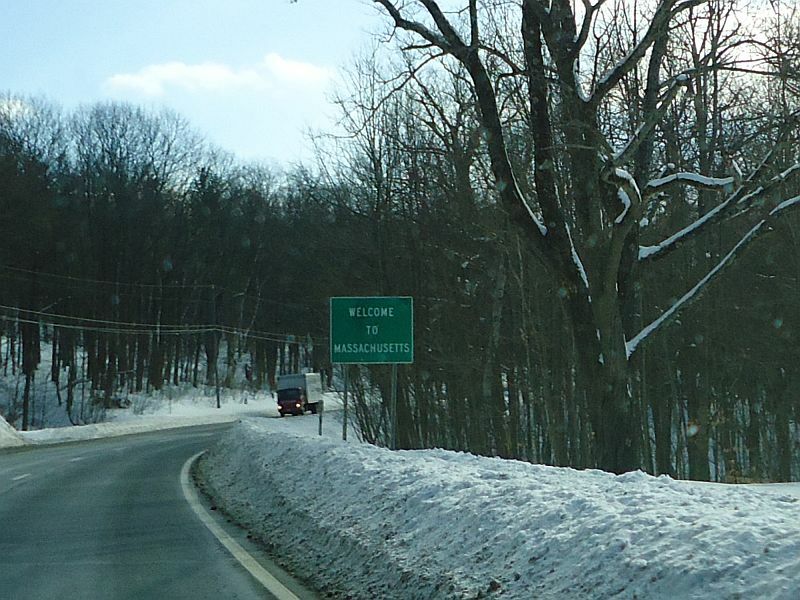 About to enter Massachusetts. THIS TIME! I had nobody behind me, which is good because pulling over to take a picture doesn’t work when the pull over spot is full of snow. Entering Massachusetts, eastbound on US 20, from New York. And now to turn around again, and get the signage westbound. 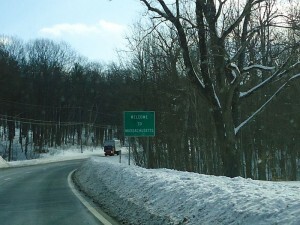 Leaving Massachusetts, westbound on US 20, and into New York. I got the Welcome to New York sign, but it’s fuzzy because I found the one pothole in the road just as I took the picture. I was not going to try again. Enough. I’ll go again when there is no snow and I can pull over. 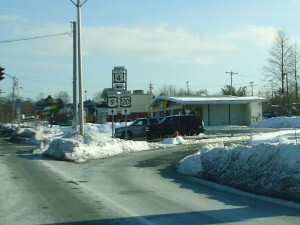 Junction US 9 and US 20, westbound on US 20 in New York. Eastbound, I missed getting a picture of US 9 meandering off to the right. Coming back, I was a bit more prepared for this taking pictures of signs while driving, dodging traffic, watching the signals, dodging traffic. Here’s the signage when US 9 comes in from the left, and the two, US 9 and US 20, go off to Albany together. Heading home, I realized I also had the south/west end of Route 4. It was a south end, because the road went north, but the route being an even number meant that it was an east/west road. There was a junction 4 sign, and then a sign that translated to US 4 North, there is no south. From reading the various roadgeek websites, that meant this was an END. Oh boy! Headed westbound on US 20, signage for junction with US 4. Why not? I was here. With the requisite turns and turnings around and turning around again, and then again, I got a series of end-of-route signs for US 4. Also from my reading, having a route end with no “END” or “BEGIN” is not uncommon. The turn for the start of US 4 north. US 4 northbound, the first/reassurance sign. The first US 4 sign, with “NORTH” above it. 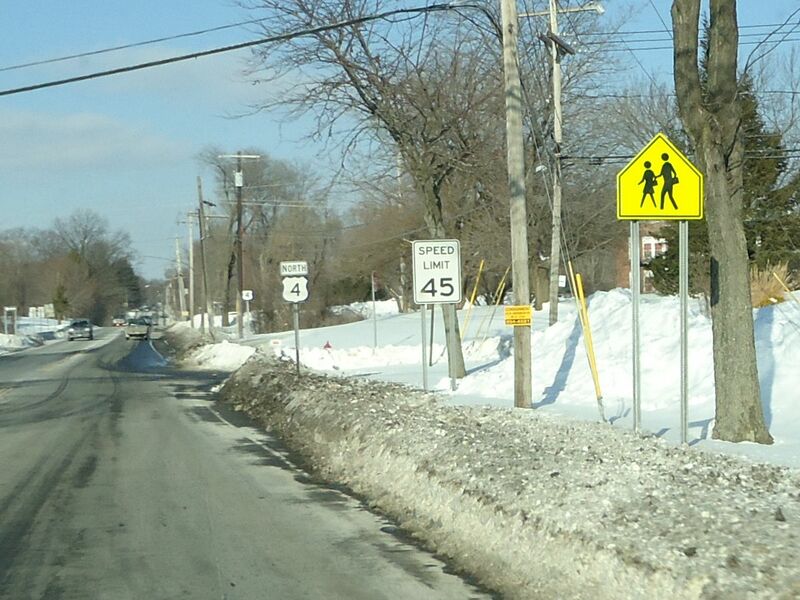 You can see a plain US 4 sign a few yards down the road. Dodging traffic, driving in to the sun, the return shot didn’t come out so well. But I have it. 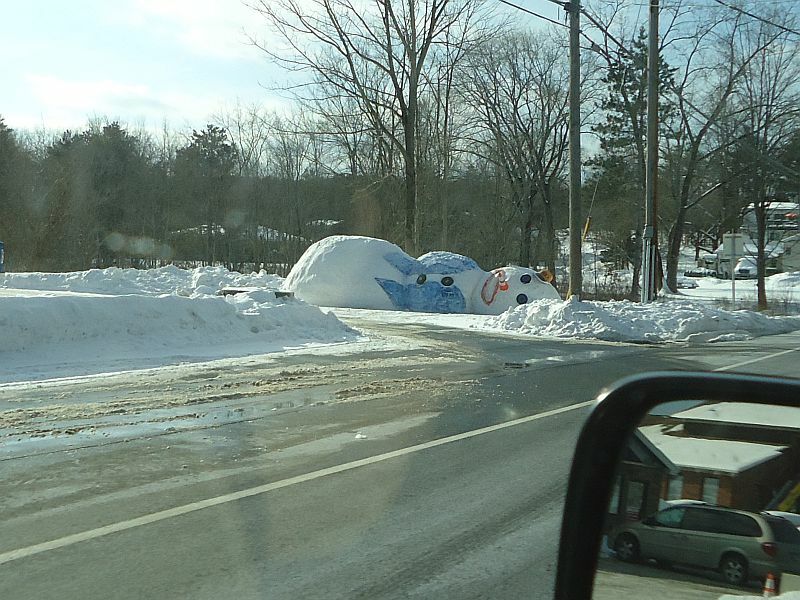 And one of the unexpected joys of winter.